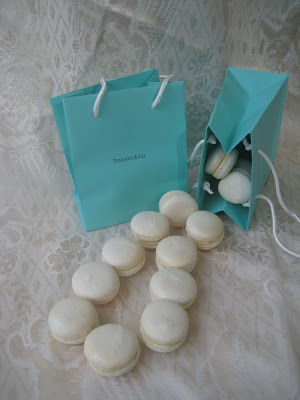 Macarons are just the perfect snack for a breakfast at Tiffany's..... light, easy to eat and you can stuff a bunch of them in one of those little blue bags. 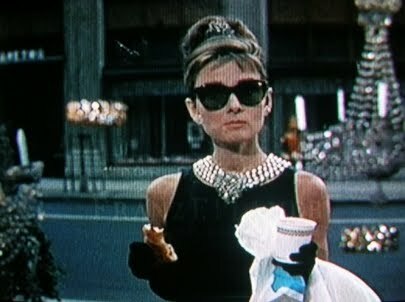 Another bonus no flaking crumbs, or dusty icing sugar to spoil your little black Givenchy dress. My macarons are supposed to look like a peal necklace falling out of the bags, and I'm not sure I quite captured that effect. They are plain white almond french macarons dusted with pearl luster dust filled with a vanilla bean and white chocolate ganache. Recipe is based on the Pierre Herme one I usually use, click here for the rose version. Once again this is for the August Mac Tweets challenge which was movie themed. 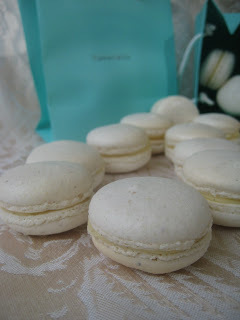 Check out Mac Tweets later in the month for many more talented and creative macaron's. Love it! I really could tell those macs were supposed to be a necklace before I read your post-honest! Yes it looks like a Yummy Pearl necklace! Would you believe I have not had the pleasure of tasting a macaron (or is it macaroon? I never know) So I must have a hold a Macaron Tasting Ceremony some time soon! Yum! I agree! I am still craving another bite of my first try of these little beauties! 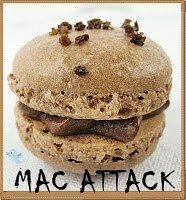 Any great (no fail) macaron recipes? I have seen past posts of your fabulous macarons...they look perfect! I am impressed. I haven't even started to think about my post yet, but couldn't resist taking a peek at yours. They are beautifully executed. So elegant. White chocolate and vanilla bean...sign me up :) I think they look quite pretty and pearl-like! OMG fantastic interpretation of the challenge. These are just beautiful! 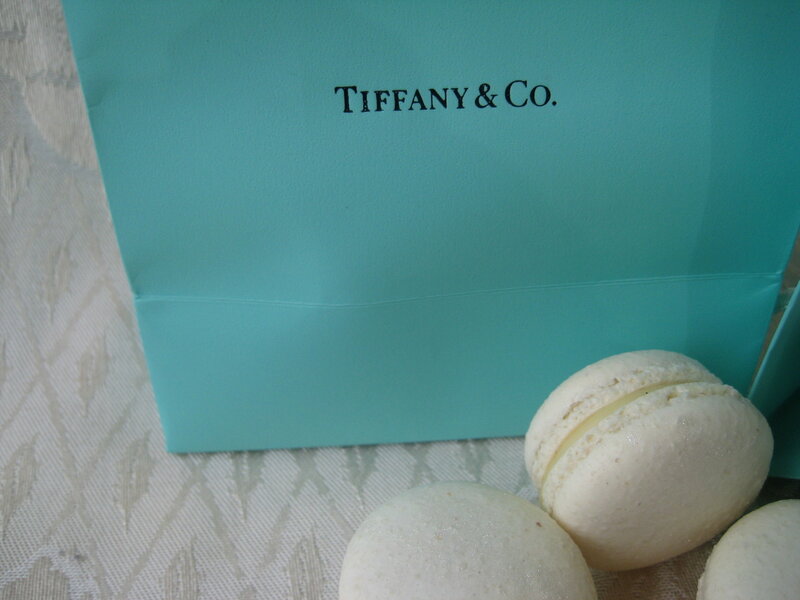 These are beautiful...Breakfast at Tiffany's is one of my favorites...you're macarons belong in Holly's hands ! Gorgeous ! What perfect, classic beauties. I love everything about your mac's and post. I love Breakfast at Tiffany's! And your pearly white macarons are gorgeous! How did I miss this - so sorry I have been on vacation! This is just perfect and so definitely a pearl necklace! The macs are gorgeous and the movie fits them so well. Yay for you! So glad you bake macs with us!